If you’re an avid follower of our blog, you know that this topic has been brought up several times. In fact, we talk about it almost every time a semester starts. That said, as my time in Leiden is going to end soon, I would like to offer my 3 cents to help future students weigh up all the options available for your house-hunting venture in Leiden! If you know nothing about the Netherlands and Leiden, this will be the most immediate and reliable source of help. The 350 EUR fee may seem daunting to some, but in all seriousness I would rather pay that amount to be free from all the anxiety and stress. Nonetheless, there’s one thing that you should consider. If you receive your decision long enough before the housing application deadline, go for it. Even if you’re still unsure about enrolling, just send in the application, you will be refunded if you don’t come to Leiden eventually. I had to wait for my scholarship result so I only applied for housing after the official deadline, so I ended up receiving an offer for a place in The Hague, which I had to decline in the end. I couldn’t grasp how serious the first-come-first-serve policy at first, so now I figure out that you will have to apply for housing as soon as possible in order to have a higher chance of getting the place of your choice. Another tip is that even if it does not end up well with SEA Housing, don’t be sad that you will lose 350 EUR. You can use that for your housing application in the next semester, which is more optimistic because that means you will be quite on top of the waiting line. I got my 350 EUR refunded at the end because I was lucky enough to find a place by myself in my second semester. The amount I paid to the agency was actually almost the same with the fees I have to pay to the housing office, so I would say this is definitely an option. It may even be your best bet if you team up with some other friends and rent a whole apartment together. However, in peak season (fall semester), it is very likely that even the agencies will shake their heads, so be fast! This is the worst and the best option. Worst for prospective students and best for those who are already in Leiden. 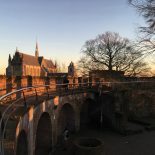 Most Leiden students will post here if they are looking for someone to takeover their contracts or to sub-rent their places. Often you don’t have to pay any broker’s fee, and the rooms are all nice because the people are all victors of the house-hunting adventure 😛 That said, once a post is up, everyone jumps at it. Like everyone. You will be amazed at how fast the room/apartment is gone. So even if you try to stare at the page and refresh again and again, the fact that you are not physically in Leiden to meet the renters (and sometimes not even in the same time zone!) already decreases your chances. BUT, once you’re here and plan to move to a better place, it will be much more hopeful! I managed to find the best place available (bragging here a little bit hehe) through this Facebook page after 4 months being in Leiden! This entry was posted on December 30, 2015 by in Student Life, Uncategorized.